TO FIND OUT MORE OR TO BOOK A COMPREHENSIVE SURVEY CALL 0208 242 6562. Guardian damp proofing employ fully trained ‘Certificated Surveyors of Remedial Treatments (CSRT) who have gained their qualifications through the ‘Property Care Association‘ formerly part of the BWPDA and are conversant in the latest diagnostic techniques and the most up to date treatment methods available. If you require an inspection on a property Guardians surveyors are available to carry out an inspection and provide a specialist report & quotation. 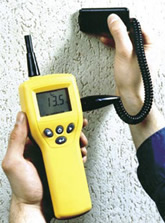 Our damp survey reports are usually sent within 24 hours of the completed survey. Where treatments are recommended, our report / quotation will clearly describe the nature of the defect(s) and the proposed remedy. The report is dispatched promptly and will include CAD floor plans, detailed specifications, a quotation of costs and timeline for the duration of proposed works. We undertake jobs of all sizes, from small dampness problems in domestic property to major contracts. Our quotations are very competitive, combining excellent value for money with the high standards one associates with Guardian damp proofing. All Guardians work is underwritten by our long term Guarantees. Guardian can arrange for a Surveyor to meet you at your property or collect keys on your behalf from an estate agent and conduct the survey without you needing to be present. Guardian offers an efficient service making them the ideal specialist for your damp and timber problems whether big or small.